Yippee and Yeee-haw! Longhorn Lasso is a blast! 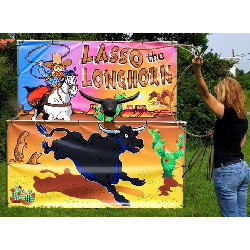 Kids and adults will have a rip-roarin' time trying to lasso the bull's head! PLEASE NOTE: Prices displayed on the website are based on a four (4) hour rental.